The user interface was upgraded a couple of years ago, and now there are many templates that can be customized and saved. The analytics tools are also great. Also, as a non-profit, we get 10,000 FREE e-mail credits every month! The formatting, spacing, etc. doesn't always work correctly with different e-mail platforms. An e-mail might look fine in the draft, but when I send a test, it often doesn't look right. We use Outlook in our offices, and the test e-mail appears with spacing, fonts, etc. uneven or different, but everything often looks OK on Gmail. So it's important to check the test version on different platforms. So far I haven't found a way around this, since making the changes in VR doesn't always help. Take time to get familiar with the many features. We are reaching hundreds of constituents for whom we only have email addresses, but not physical addresses. VR also enables us to send many more communications at a fraction of the cost of snail mail. E-mail addresses usually remain with donors or volunteers, even if they move. And it's a convenient way to link to articles and sites of interest to our constituents--and our website, of course. "Great for non-profits, but a little clunky." I love the non-profit program Vertical Response offers. It allows me to send 10,000 emails for free, allowing to save more money for operating our non-profit. It is easy and reasonably inexpensive to add more 'sends' too, making it a great option for us. The UI is a bit dated and can feel clunky at times. Most actions are logically organized, but they do not feel very accessible, and I don't necessarily 'feel good' when using their interface. The product is technically great at what it aims to do, but is a bit less user-friendly than some of the alternatives. Great option for non-profit customers! With the non-profit program, Vertical Response has allowed us the flexibility to build out our email campaign program. We can experiment sending a lot of emails that help us refine our trategy for targeting our donors and supporters. "Great Emailing Resource and Affordable"
Upon researching for an email resource, I came across some vendors that required subscriptions that were not affordable for my operation, nor did I need the amount of emails that were in each subscription level. Others had the option to buy just the emails you would use, again it was unaffordable. I came across Vertical Response, and honestly the think that attracted me at first was the price. Upon using it, it was very easy to use and I was sending an email within no time. One drawback is that many of my email campaigns were only seen by 30% (if that) of the people I emailed. I collected emails at trade shows and used those emails within the campaign. Some of the emails were wrong, but I gather the majority of the ones that were not opened were sent to spam. This is upsetting because I confirmed my information and that I gathered the emails from the email owner knowing they would be receiving it. By emailing out the way I can with Vertical Response, I'm able to reach my audience much more quickly and efficiently. Since their pricing is affordable, I'm able to do so without breaking the bank. I love being able to keep in contact with my clients, but if I'm sending out a similar email out to hundreds of people, I'd prefer to not have to type the same email or copy/paste for each email address. Vertical Response allows me to keep in touch much better. At the time it was great for basic email creation. Very simple user interface and the templates to choose from work well for a variety of purposes. List upload and sending was not an issue (some platforms can make it a hurdle just to go through this step). If you wanted to do anything more sophisticated you have better options out there. If you want better organization of campaigns, list management, etc., you won't get that with VerticalResponse. Again, great for your average ESP but nothing that makes it especially noteworthy. If you have basic needs, this will work. If not, you'll want to look for a more robust option. At the time we needed a program with easy template building and list importing. This made us efficient on several projects prior to upgrading our system to the advanced integration we have now, but we are also managing a large inventory and that type of sophistication is necessary. 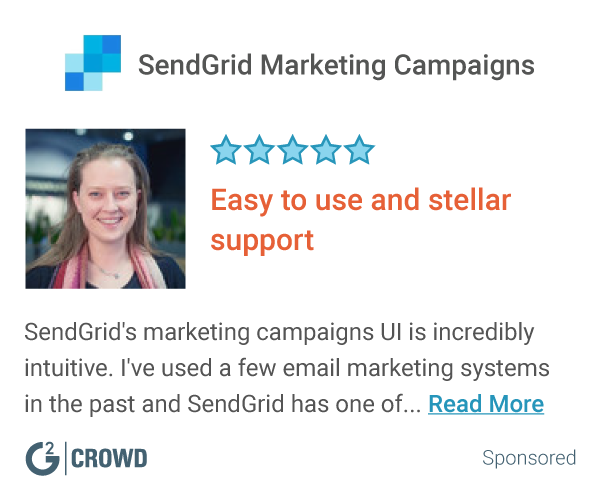 "Takes awhile to get used to, but out performs"
I really think the platform is more user friendly than other email marketing companies. Other companies that offer other things like event management are the only companies that are truly more unique. Vertical Response has been my go to for the past 7 years unless you are looking for a free program. I think the emails integrate well, have a great html upload, it's easy to manipulate the code and wysiwg builders, and then you also have access to surveys. The templates are a little 'not so great'. This is not a platform for beginners or companies 'just starting out' or perhaps don't have an idea of what types of emails they should be designing. This is great for the company that has a designer or marketing person who already has a grasp of what they want to design independently, codes html, etc. I like the analytics and tracking, and I really like the ability to grow your lists. Vertical Response makes things 'very clear' for those signing up. I absolutely hated using vertical response. The only easy part of VR was importing the email addresses to use and that was only because it was attached to our salesforce CRM. Where to begin, creating an email to go out was next to impossible. It was no where near the ease of use that one should find in 2018. I used to call it Windows 97. Remembering which way to create your campaign was hard enough but one in VR, if you didn't already make your graphics as a jpg on Photoshop, you had to have knowledge on how to write HTML. While importing names was semi easy, remembering which buttons to push in order to pull the report is next to impossible. I never was able to pulll email addresses out the same way. Analytics were not available when I used it, however we switched early in 2018 and it may be available now though I doubt it. I would tell them not to. Use something like mailchimp. We were trying to begin strengthening our marketing. As a relatively small non profit we have very few staff members and the ones that we do have often don't have the knowledge on how to utilize things of this nature. Something like MailChimp is much easier for people with no knowledge to utilize. "Okay solution with clunky interface"
The interface is extremely slow, so we end up sending fewer newsletters than we normally would because it often crashes or has errors. It reminds me of early 2000s technology. Vertical Response is still one of the only products that gives free e-mail marketing services to non-profits up to 10,000 e-mail addresses. I am on the board of a non-profit that has limited funding. We deeply appreciate that Vertical Response donates solutions so the charity can reach up to 10K users without needing to pay any monthly fees. "Straight forward for the novice, customizable enough for the pro"
No hoops to jump through. Upload your lists in a simple CSV format, pick your subscription (send once and pay per email, or if you are high volume, get on an unlimited plan), and design your email. If you know no HTML, their templates are easy to play with and send. If you have a graphics person on board, the sky is the limit. Easy reporting to see how your emails perform. I wish they would update their templates more often, add a certain amount of new ones monthly. Also keep an eye out for your emails getting chucked in spam. This has more to do with the industry and using HTML emails than with VR so that one is not really their fault. You won't find an easier program with the level of functionality it offers at a better price point. Getting a national message out to the market in a consisten basis at an affordable price. Vertical Response is easy to use. It has many templates to choose from. I don't like that you cannot create a registration for someone to sign up and pay for something. "Excellent and easy to use email marketing service - very good to nonprofits"
Vertical Response offers very easy to use WYSISYG interface with a lot of decent templates, easy compliance with CANSPAM laws, and all for virtually free for 501c3 nonprofit organizations. If you send less than 10,000 emails a month to your lists, you will never have to pay for the service. In the forms they offer to embed in your website, or even if you use the API and create your own form for your customers to opt into your lists, there apparently isn't any way to offer through one form the option of signing up for multiple mailing lists. This apparently requires multiple forms, which is cumbersome for customers. Yes, by all means, especially if you are a nonprofit. Vertical Response has allowed us to provide easy email newsletters communications with our supporters without having any repercussions on our domain from any issues associated with mass mailings. "Easy system with low spam rate"
What I love best about Vertical Response is the Heat Map function so I can see where contacts are clicking on the email. This allows me to see what stories interest my readers most and help me create engaging content for the emails. I also love the A/B Testing with subject lines. This allows me to explore different subject lines so I can see what users like best. Sometimes the formatting can be a little off with the emails, so you need to make sure all of the photos are sized the same to avoid the issue. I also do not like how Vertical Response emails go straight to spam so you have to add them to your safe sender list. Make sure you have your email lists imported in an excel document so that you can add them easily when you set up your account. Also, be sure to pick the right plan based on how many contacts you have. We had a much larger contact list so we had to upgrade a few times right off the back. Getting our content out to the public. Also, making newsletters and email blasts easy! I think these emails help increase our brand awareness. It also helps when we are promoting contests or giveaways on our channels. "Clunky but free email app "
The cost of this app is what is appealing and the fact that it does work with Salesforce. However, other than that I really don't have much good to say about it. Other than it being free I dislike the majority of what the app offers. The way in which email are created is very clunky and time consuming for staff. It takes up to a day sometimes to get a email out the door when the content has already been provided. That is because the majority of the time when we send test emails they look different than what we see in the preview. Their support is helpful when I do call in but normally there is a long wait and I am still never 100% satisfied with the email that are going out. Go with a better option. Mailchimp or Campaign Monitor are much better options and you will save money and time in the end with either of those options. Cost effective email solution with a connection yo Salesforce. Money savings, however that savings is washed out by all the staff time that it takes to create and send emails. "Great email newsletter service for Non-profit Budget"
The company's non-profit program that allowed us as a non-profit to send up to 10,000 emails a month. This saved our organization quite a bit of money and allowed us to have a greater presence and to stay in touch. I liked that I had a lot of ability to change the formatting. It was easy to upload new emails or for people to be removed from emails. Automatically checked for duplications. "Reliable, tried and true! " Easy to use interface, great analytics super templates! You will not be disappointed! Whether your a novice or a pro the VR platform is easy to use! Saves you money and time! Highly productive tool! This is a great tool for our non-profit clients that are working with a limited budget. "There's a lot to like about Vertical Response"
Vertical Response makes it really easy to manage all of our email campaigns. The UI is very simple to use, and in every instance, their customer support has been very knowledgable and helpful. We felt really limited by the campaign templates provided by VR, so we dedicated our resources and personnel to build our own HTML to import, but it would've been much better for us if there was more variety to begin with. As with all things, you'll want to compare services, but really try out everything that VR has to offer if you're going to go in that direction. Having a level of comfort with the UI and what your day-to-day usage will look like will go will enable you to make the best decision for your company. The best all-around benefit is the cost-efficiency for the number of campaigns we can send; for the purposes of our small business, the various methods of campaign tracking has really enabled us to expand the reach of our content marketing and illustrations of our services. "I use Vertical Response for all of our company's mass emails"
The ease of usage. You can easily create an email using an existing template or create your own. There isn't much I don't like about vertical response. If I had to say, probably I would like it if they did not count bounced back email addresses or unsubscribes as part of your email address limit, otherwise you have to delete all of these to make room for more or upgrade. I would suggest you switch to it. Even if you don't have much experience with building emails, they have an option of building your own in a "Microsoft word-like" setting. It allows us to quickly get an email blast sent out to our entire customer base which is definitely beneficial in an emergency situation such as weather or technical issues. "Mass email marketing for all levels of experience"
Vertical response has a super simple interface that includes professional templates and customizable designs. You are able to manipulate an email in any way you'd like through the easy drag and drop system. Vertical response could improve its bounce rate stats through improved research into the firewalls that are blocking the emails. This would increase the delivered emails which is a vital number to any business. We are streamlining our brand through cohesive messaging via email. We are able to simply make copies of old email and update the content to match our needs. The ability to keep lists current and to pull reports on sent emails. At times design takes a while as fonts don't "stick" when text is inserted. Also, the received email looks different (from a layout standpoint) than what is seen in the design screen. This makes for a lot of back and forth to get it right. "Great mass email/marketing tool when integrated with Salesforce"
VerticalResponse offers plenty of templates and ways to customize your own newsletter templates via a design module or with HTML. As a nonprofit, we have access to a limited number of emails that we can send each month for free, but the limit is so high that we are able to take advantage of VerticalResponse for free, even while sending out at least 2 communications a month to our entire contact base. VerticalResponse emails are tracked in our HTML Email Activities both within Contact's Salesforce related list and via custom reporting. We can track opens and clicks at every level and adjust our processes accordingly to improve our open and click rates. It is intuitive to use! The process of refreshing lists is a little burdensome. You should be able to not just select lists but also queries. Since it doesn't, my workaround is to refresh the list first, then go back into my draft to schedule or send the email. A little clunky. Also, I wish they would allow more than one Salesforce user account to work with a VerticalResponse account. We would like to have more than one editor of a newsletter but we can't do that in the Salesforce instance. Beyond that, no other complaints. The experience is better if you can use HTML to really customize your templates. While there are plenty to choose from, they aren't easy to customize, so better off making your own from scratch. VerticalResponse is great with Salesforce. I can't speak to the benefits of the tool as a stand alone product. We needed the flexibility to send mass emails past the native limits in Salesforce. While there are plenty of mass email/newsletter products out there, we needed one that would use Salesforce as the contact database, and update the contacts if needed (e.g. email opt out). The app had to articulate in both directions with Salesforce. VerticalResponse was the best app available when I first investigated the exchange (i've used/promoted this app for the last 8 years across and with at least five different organizations). Even though there are even more options available now, I stick to VerticalResponse because it is still more intuitive than re-learning the others. "Every affordable, very easy to use"
The process simple. Just three steps to sending our mailing lists, blasts and one-off communications. Every once and awhile the template must be adjusted and it is important to want your heading text in the HTML version and the text based version. "Using the classic version, but still effective for the most part." The ease in which emails can be sorted and bounced addresses phased out. Email Wizard is not very easy to navigate. May be because we haven't upgraded, but it doesn't seem very intuitive. Get the monthly package if doing more than a couple emails per month. Also, get the newest version. We are getting our newsletter out to our entire client base weekly and they all have the same clean formatting. "Easier to use compared to other products"
Comparing Vertical Response to other tools similar to it, this one is much easier to use and simpler. It is easy to upload my designs and add links, backgrounds, very user friendly. I have used other softwares in the past and I disliked a lot of things from them. I find that Vertical Response is much better compared to them and so far I have not found anything that I dont like. I recommend to at least do a 1 month trial to compare it with what you use currently. Email marketing campaigns for my clients. They provide 10,000 free emails each month for non-profits. They also have really good list segmentation. There is a learning curve and some limitations, but the product offered is one of the best on the markets. We use VR to provide updates about events and keep people informed. "Great email newsletter tool for beginner and advanced users"
This is a program that can be easily used with newsletter sign-ups online on your own website and for maintaining a segmented, targeted database. It also has a simple design tool that beginners can use to craft an email, along with the option for html creation for those with advanced knowledge of crafting online newsletters. Having to update an html newsletter when I'm not familiar with html.... and sometimes I run out of room on my photo library storage. However, these are minor issues and easily overcome. Sending targeted newsletters by interests of our prospects. Seeing the results, click-response, to those newsletters, so that our marketing programs can be adjusted. "Horrible service --- Way too many false positives on "reported clicks" from email campaigns." Easy to use interface. Thats about all I like. We run email campaigns with links to download a paper, or watch a video, or attend an event. Post campaign we run a list of people that "clicked the link" so that we can call and follow-up. Come to find out that many of these reported clicks are "false clicks". They did not click the link after all. This ends up being a HUGE waste of time for our sales guys. Look elsewhere. When I called support about this, they sweep it under the rug. None. Now that I realize we are wasting our time following up on false clicks. You cannot export analytics from the reporting dashboard?! If you just need to create and send emails this is great. if you need to understand how those emails perform and tie back into a CRM consider a different solution. I mean....at the bare minimum it does what it's supposed to. So points for that, I guess. What DON'T I dislike about it?! It's clunky and hard to work with. It tends to chop the edges off my finished documents. Even the Wizard feature isn't as user-friendly as they'd have you believe. The template feature is limited as all hell, and incorporating it into a document is a headache! YOU have to implement the Autosave feature, and heaven help you if you don't! Run away! Save yourselves the headache and find another mail client....ANY mail client! It does get mass emails sent, but not without a sacrifice to the gods and the tears of a yak. "Might Work Better with Other CRM Softwares"
I like that building the email is pretty user-friendly. We cannot connect with our CRM software, so no capabilities for drip campaigns, etc. We love that we are able to get information out to all of our customers! "It has not been a pleasant experience while using this product/service." Nothing as such. I am disappointed after using this software. I have used for several years for sending marketing emails, but every time they make it so difficult. Their technical support is pathetic. No one knows what's going on. The email results seemed to be made up. The service has been degraded. Earlier they had good technical support but now somehow it seems to be degraded. Sending marketing emails have been the problem while sending through this service. The emails don't reach the destination as I believe the server which sends emails have been blacklisted by most of the recipient servers. "Pros and Cons of Vertical Response"
Relatively easy to use and navigate, laid out in an intuitive way, filters out contacts that are duplicates or that have bounced back. Website is frequently slow to load, not an easy way to import/export contacts from outlook, if you don't hit the save button when you're creating an email then you will lose your work. Compare other options to Vertical Response before committing to this product, there may something available that is more tailored to what your business/company/organization needs. "Kind of outdated but it works"
I like that it is relatively easy to use. And gives options for visual or HTML base design. The templates are nice too. It seems to be glitchy. Text does not format the way you want it too. Formatting will stick around after you delete something. I have found that I have to clear all formatting from by copy/pasting into note pad before I can change a styling. I remember they had came out with a new version but it was taking them a LONG time to move us from the old platform to the new one. WAY TOO LONG. I use HubSpot now and I like it much better but there are still cons to both. I looked into MailChimp as an alternative but switching can be daunting. I never got to use the new UI of Vertical Response so maybe it has stayed competitive with the other "shinier" ones. Email marketing. It did the job but didn't look the prettiest. And the free templates were so so. It was easy to use and had a lot of easy to use templates for email campaigns and newsletter friendly features. At times I found it a bit too basic and the user friendly nature of it started to work against it because I wanted more and for it to provide more context. In order to keep up with some of the other similar platforms I think they are either going to have to provide more options/features for the user to make the price worth its while. We used Vertical Response to send out newsletters and blast emails in an efficient manner that would provide us with easy to use metrics and inter-workings. "Great tool to publish newsletter"
The possibility to publish and distribute newsletter to your contacts very easily. Statistics to follow how many contacts open the email, how many click on the links etc.. It was quite something to publish the first newsletter. I was not familiar with the software before (nor with publishing and distributing newsletters) so the learning curve was intense for me. But I walked through it with coworkers who are more experienced and with time it's getting easier. Great software to publish and distribute your newsletter and track your contacts' interaction with the content you send. Easily publish and distribute newsletter. Vertical response is very easy to use. YOu dont have to be professional or know HTML. It has great integration with my web site forms, this allows us to collect emails from people who use our forms for donations, or registration as volunteers or particpants in our many programs and projects. They have a free non profit plan that is amazing. email Communication with multiple groups and segments of my organization. The ability to segment and use diff. lists for each group of people we communicate with. "Worst Service Provider i have had the pleasure to use"
I have nothing good to say about this Vertical Response. Dealing with Customer service i was treated like a criminal. Apparently it is illegal to use email marketing for an established customer base. wait is that not VR's Business? Horrible to deal with and they don't like to refund your money once you give it to them. FYI this is the first time i have actually taken the time out of my day to write a bad review. "Great Email Service Provider for start up company"
Email marketing is a huge part of a business and it is a necessity to get our customer engaged and aware of our brand. I do like how vertical response is an affordable option for companies with a lower budget in marketing. They have an option to Pay as you go option which provides great flexibility. This service offer a great balance of pricing, reliability, flexibility and analyzing. I like how this software takes measure in the anti-spam policy. I would say this software is one of the best entry level email marketing service provider that is on the same level as some other popular ones in the market. I also enjoy how there is a huge online image storage for our newsletters! I believe it is about 20 MB. Their campaign creating template lags and is a bit tad glitchy from my experience. It does get the job done but sometimes the browser lags and freezes, which delays some work time. I generally use google chrome for vertical response campaigns. I also dislike that the spam checking tools are not very available. I enjoy this service because it real time reporting and statistics. This is great for any company who is just starting out in the email marketing or for all start up companies because of the low cost and ease of usability. When we had a very low budget for marketing, I used this software as an entry level email marketing service provider. The template creation was very easy so it was easy to train our employees. We were able to send small email segments for free and we were able to track our open rates and click through rates on our products. I currently use the free version of Vertical Response to manage participant contact information and to send out email communications. One of the best features with Vertical Response is the large selection of templates available for emails and ease of use. I find the software to be extremely user-friendly! I dislike that I am only able to add up to 200 participants and their contact information before signing up for a monthly subscription, however I do understand the necessity for creating and adhering to a cut-off for free use of the software vs. paid use of the software. I also feel that the entry fields for contact names/info could be easier to adapt and edit. "Vertical Response is very useful in transmitting newsletters." That it was easy to format so that I could upload my newsfeed on the same template each week. Analytics were very good. Conversion of Newsletter to PDF was a good feature. When the software was updated it did though me for a loop. Caused me to use the editor to reformat my template. used up so time. Make the template editor more user-friendly. Trying to get newsfeed subscribers to actually log in and read and get feeedback. Was somewhat successful. "Vertical Response is NOT user friendly"
It's okay with customizing templates, but other than that...not much to say. You can only upload JPEGs, it's text editor does not deal with formatted text well. I need to copy in plain text if I want it to in any way resemble what it is meant to in the viewer. The plain text version is terrible. Social share options look like they are from 1998. Easy to use and can send multiple eblasts in one sitting. I am reaching masses and have made some sales just from my VR emails. "A happy user since 2011"
I've been a happy user of VerticalResponse since 2011. Use it for regular mailing campaigns to customers and prospective customers. Great layouts, tracking, functionality. Easy to copy and adjust previously used layouts; easy to re-target previously emailed targets; and easy to build new lists by combining previous targets (e.g. all who didn't open or click in any of last week's various emails, etc.). 1) The new VerticalResponse looks great and has more responsive designs and looks even easier to use than the old version. Unfortunately, there is NO way for old version customers to just have all their info transferred to the new version (and I double-checked with customer support). You'd have to do it manually and lose a lot of historical data. Seems to me like that should be an automatic transfer for old customers. 2) VerticalResponse doesn't have as many integrations with CRM products as other email marketing solutions. Great tool for keeping in touch with customers or notifying customers and prospects about new updates/products/promotions. "Great way to communicate with a large amount of people"
Vertical Response has great customization features to be able to group users to send various types of communication. It is an inexpensive (free for most) way to communicate with a large amount of people. I have not had any issues with it so far. I am able to communicate different types of information to many people in a minute or less! There is great feedback on the results of the campaign in the back office. That was helpful. It was a little hard to setup initially and make changes to the selected templates. We have a way to constantly inform our clients about specials, new products, etc. "Love the Auto Resending to UnOpened Addresses"
Being able to send a new email to those users who didn't open/engage with the 1st email. This alone is the reason we have moved to use this service. Also they have the lowest pricing out of the big providers. Templates aren't as easy to customize as some other providers, but overall inline with most. Check the pricing, its great and the 2nd email that goes out will always increase your results! Getting more exposure for the emails we send, as getting the sending of the 2nd email increases our overall open rates and engagement by double digits! List management is very easy if your lists are organized and clean. Design functions are really limiting and static. If you don't know HTML, definitely teach yourself or take a class so you can import your own code. Makes the designs MUCH improved! At my company, cost is our highest concern so we currently use this platform for one audience group, and another platform for another in order to keep costs low. Unfortunately, the designs are totally different and very limiting and we are unable to make the emails look uniform without putting in our own code. "Not bad, cheap, improved over the past year"
It can be a little confusing with lists, contact forms, etc. Reaching those who sign up for events and have attended past events. Very basic email marketing service...the non-profit send level is great for 10k sends per month. It is a bit tough to customize existing templates. For non-profits, we are sending quarterly newsletters. "Nice basics, but nothing flashy"
"Simple tool for complex problems"
The analytics breakdown per segment is extremely useful and has allowed us to retarget specific audiences more efficiently. Managing lists and segments can become pretty cumbersome over time. Vertical Response has allowed us to send email to prospect audiences without cluttering our CRM. It allows us to manage various touch-points with a broader audience and them bring them into our CRM only when they have provided their most current and up-to-date information. * We monitor all VerticalResponse reviews to prevent fraudulent reviews and keep review quality high. We do not post reviews by company employees or direct competitors. Validated reviews require the user to submit a screenshot of the product containing their user ID, in order to verify a user is an actual user of the product. Hi there! Are you looking to implement a solution like VerticalResponse?